Houston was, is and will again be a rodeo town...and that means that those of us who lost old cowboy boots may soon be investing in some new ones. As any true rodeo (or shoe) lover knows, a great pair of cowboy boots can be a big investment, so it’s important to choose a pair that fits your feet properly, without causing you pain. With thanks to legendary boot maker Allens Boots, here are some tips for fitting your boots properly to avoid pinching, rubbing, blisters and general discomfort. Your foot should feel snug in your boot, not too tight and not too loose. If you buy a properly fitting boot, there shouldn’t be a ‘breaking in’ period; they should feel great right away. Of course, the socks you wear with your boots will affect fit and, according to Allens Boots, Western boot socks are the best choice for blister and corn prevention. Unlike a sneaker, the only thing keeping your boot secure is the instep, which means it’s super-important for this part of your boot to fit properly. When you try on your boots, if the throat fits too tightly, you need a wider boot. If it’s too loose, go for a narrower pair. Whenever you walk or run, you bend your foot at its widest point, known as the ball. 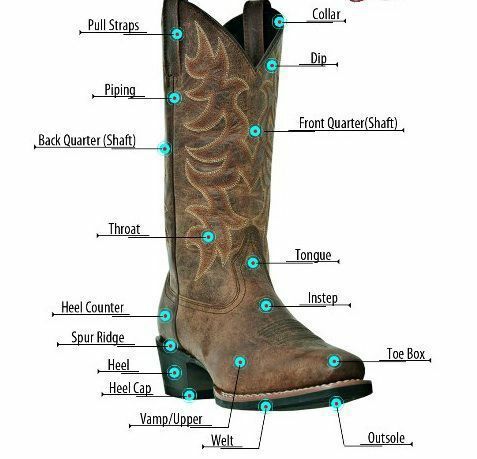 In a good pair of boots, a steel shank runs between the insole and the outsole; it extends from the heel to the point where the ball of the boot begins. If you try on a pair of boot that’s too short for your foot, the ball will be too far forward and your toes will be crammed into the end of the boot. The ball of your foot should sit squarely in between the widest part of the boot for maximum comfort. Even though I said that there shouldn’t be a ‘breaking in’ period for boots, that’s not entirely true. While your boots should never pinch or hurt your feet, you can expect boots to slip a bit in the heel when you first get them. That’s because with new boots, the thick leather of the heel is still very tough; after you wear your boots more, you soften up the leather with the movement of your heel. As you do so, it conforms to your heel and the slipping comes to an end. Now that you know how to get a great-fitting pair of boots, go out and enjoy the rodeo. But if you happen to fall off a mechanical bull and injure your foot or ankle, schedule an appointment with Dr. Andrew Schneider for a quick fix-up.